If you like deep, sensual and floral fragrances the newest collection from The Body Shop will perhaps be of interest? With seven, new and limited edition products you will be utterly spoilt for choice - rather excitingly there is even bath bombs! Each product contains hand harvested Poppy extract from Turkey for sheer indulgence. Forget roses the bloom you want this Valentine's Day is Poppies...Smoky Poppies. 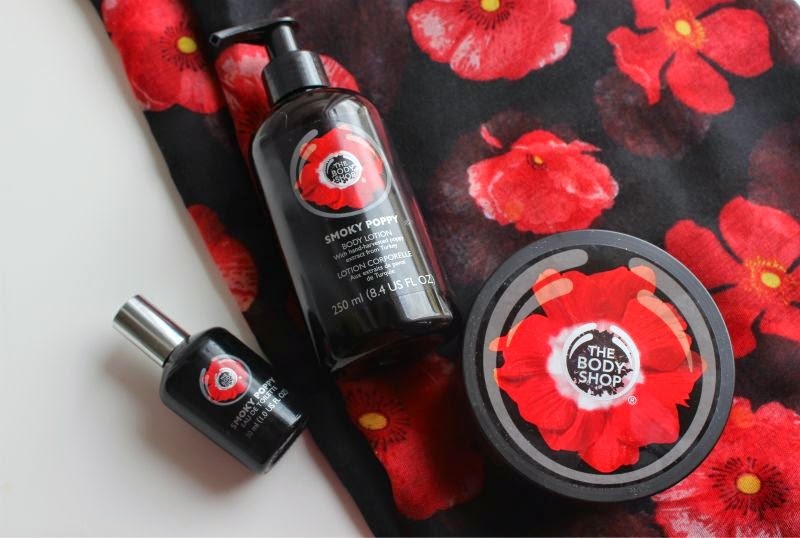 "Give your skin an exciting sensation with the new limited edition Smoky Poppy body care, the most seductive range ever released by The Body Shop. Laced with the extract of oil-rich poppies, indulge in a burst of blissful moisture. 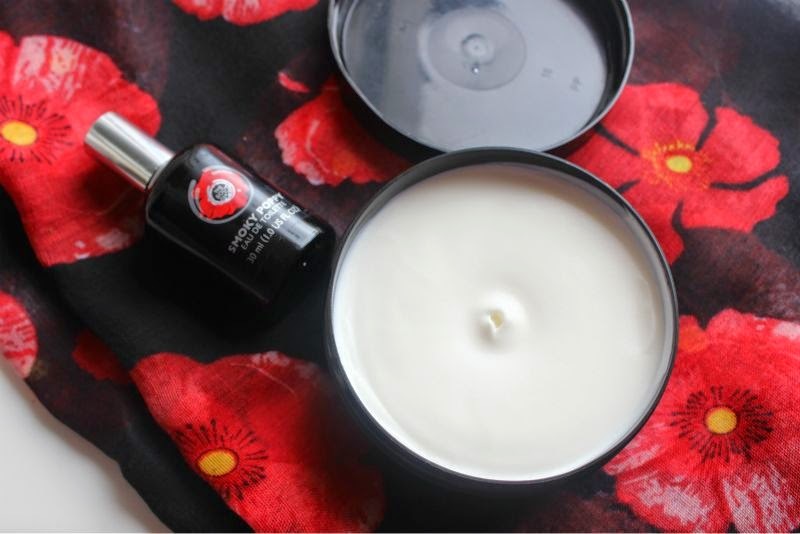 Our Smoky Poppy collection is infused with real, hand-picked poppy flowers from the Ankara region of Turkey. This sensual and indulgent range will leave you longing for more, with a euphoric scent for ultimate body bliss." Indulgent is the best term I can coin for this particular scent - spicy yet mellow, woody yet floral, it really is something else. It certainly is a stand up and pay attention fragrance and although laced with floral notes I would deem it to be unisex. Off the top of my head I can not think of anything that is remotely similar to The Body Shop Smoky Poppy but fragrances I would deem to be in the same vain are: Calvin Klein Euphoria Eau de Parfum and Jo Malone Pomegranate Noir Cologne. They are similar in that they are warm, ever so slightly heedy and sensual. 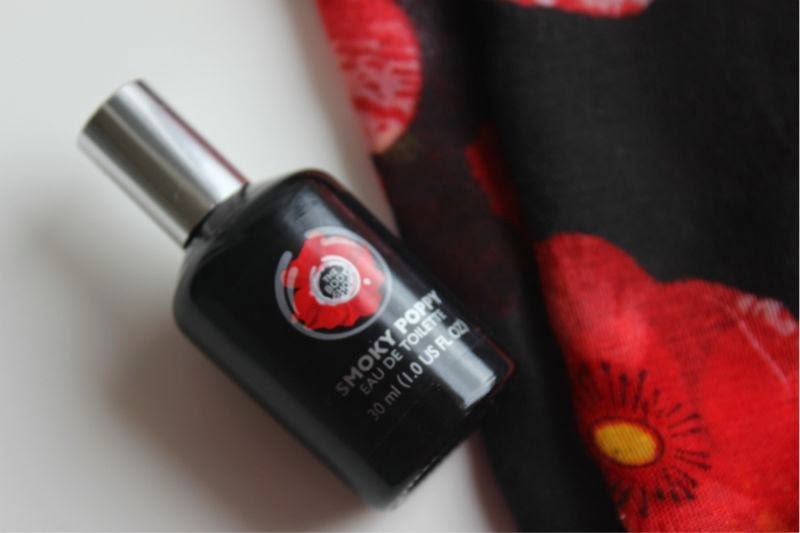 The Body Shop Smoky Poppy Eau de Toilette is strong, long wearing and is reminiscent of perfumes far more expensive than its £8.50 price tag. If you enjoy layering your fragrance for longevity and impact there are several bath and body products to help you do just that. I have been testing out The Body Shop Smoky Poppy Body Butter (from £5) which is every bit as rich and moisturising as you'd imagine - fragrance wise this is slightly milder and creamier. If you prefer lighter textures when it comes to body moisturisers then The Body Shop Smoky Poppy Body Lotion (£8) is the way to go, nourishing, quick to dry with an intense fragrance saturation. The Body Shop Smoky Poppy Collection summed up in a word? Sensual. A step away from the norm. You simply must try this fragrance out in store. I need to try the body butter! I love the packaging - it looks gorgeous. I do not know if I 'll like .. but will try .. Sounds like such a great collection! Like the packaging but not too sure if the scent is for me... miss the chocomania scent so much! I was having a look at this but didn't dare take the plunge to pick up the range, I think this is something I would have to smell in person, but I definitely think the packaging reflects what you said, it looks very 'sensual'. I love the body shop products, although I normally would go for more fruity, sweet scents. I would have to smell it in store but it sounds nice! Ohh I want to have a sniff! I love their body butters, and this scent sound intriguing! I have seen you describe scents as "heedy". I am not sure what you mean by this. I looked the word up and apparently it means heedful. I'm sure this is not what you mean. Can you explain please? Oh I love the body shop! I usually buy coconut in EVERYTHING though, but I may have to try this. I purchased the eau de toilette from this range and it is lovely. This sounds beautiful! I love the packaging!